Birkenhead House caters for the discerning traveller, honeymooners, and guests who enjoy luxurious accommodation with world class cuisine and personalised service. Birkenhead House and Villa From its stunning clifftop position in the town of Hermanus, Birkenhead Houseenjoys exhilarating ocean views and close proximity to the beach. Breezy beachhouse style is mixed with contemporary artwork and opulent furnishings tocreate an elegant and inviting environment. 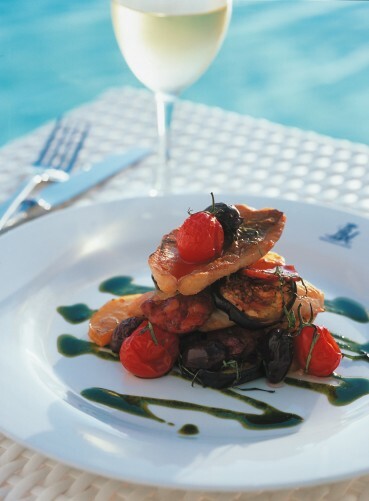 After a sundowner overlooking the ocean, the freshest seafood and most delicious international cuisine can be enjoyed. From morning coffee and cake to hot chocolate beside the fire, there is always something delectable on offer. Service in both House and Villa is attentive and personalised, the atmosphere homely, relaxed and fun. Unique in their combination of glamorous interiors, informal ambience and scenic location, these two properties are a special way to enjoy the delights of beach and ocean. Eleven suites with either sea or mountain views offer the height of comfortand luxury: balconies, underfloor heating and huge bath tubs allow guests to make the most of their stay, whatever the weather. Birkenhead Villa For families and those who seek a little more privacy, the self-contained Birkenhead Villa is a stylish alternative. 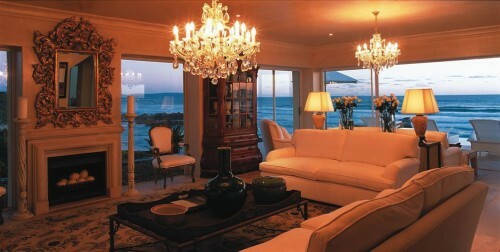 Five suites have views of ocean or pool; all are luxuriously decorated in classic seaside white. 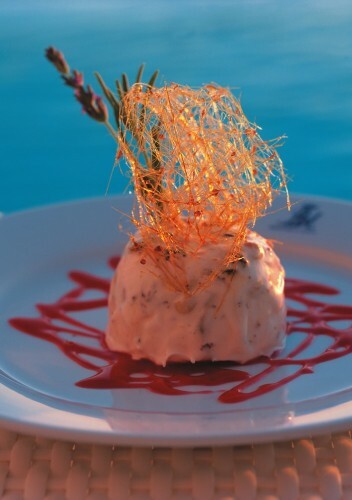 The Villa has its own chef so meals are tailored to guests’ tastes. Children can play happily and safely in the garden or on the nearby beach whilst the town with its shops, markets and other attractions is close at hand, a complementary transfer service making it easy to explore. 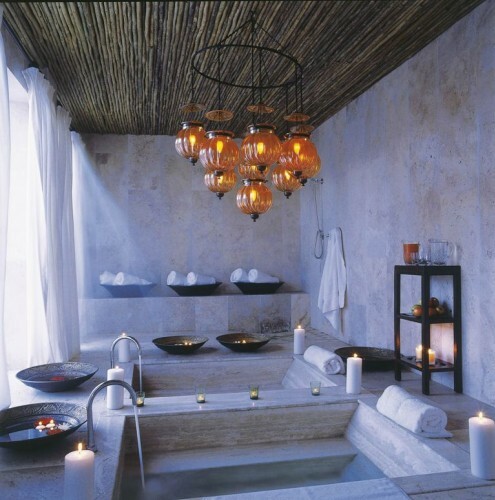 Spa, pool and gym offer the chance for indulgence, relaxation or exercise. Cliff and beach walks are an invigorating way to take the air but numerous sporting and leisure activities are available in the area, from golf to shark-cage diving. Whale watching, for which Hermanus is famed, can be done from the hotel from June to November, with September the height of the season.Other attractions include a dual-level swimming pool located in a sheltered courtyard and Hermanus’ two best swimming beaches which lie just below the sea facing rim-flow pool. 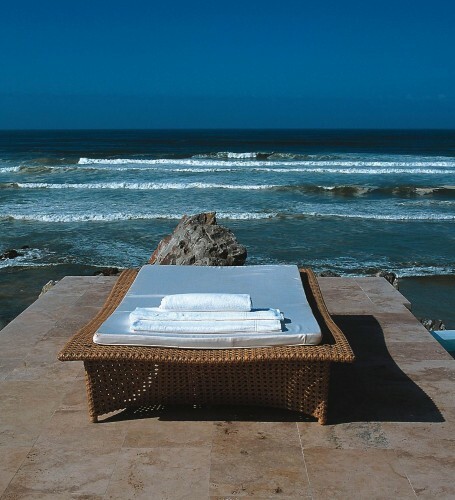 After experiencing the natural beauty of the pristine Walker Bay region, guests can indulge their senses at the Birkenhead House Spa. Offering an array of massage, aromatherapy and reflexology treatments, there’s no more relaxing way to round off a leisurely day. For those looking to stay in great shape, Birkenhead House has a fully equipped gym. Please note that Birkenhead House do not accept children under 12 years of age, unless the entire hotel is booked exclusively. Remaining balance payable 4 weeks prior to arrival. The following cancellation fees will be applied should a booking be cancelled within the following period:* 8 to 4 weeks before arrival – 25% of total accommodation fee. * 4 to 2 weeks before arrival – 50% of total accommodation fee. * 2 weeks before arrival – 100% of total accommodation fee.There is also a 25% non-refundable deposit associated to all bookings made between December 15 and January 15. Fresh and bright with dazzling ocean views from its two balconies, this is a delightfully stylish suite. A king-size Louis Farouk antique bed takes pride of place, complemented by an 18th century French gold chair, yellow silk French antique couch and original artwork. Relax amidst this splendor or unwind in the spacious bathroom with its huge bath tub, walk in shower and two vanities. A soft neutral palette is enlivened with splashes of golden yellow: two silk antique tub chairs and double bed with striped padded headboard add a touch of glamour. Appreciate the sunshine and ocean views on the two balconies furnished with table and chairs or relax in the glorious freestanding Victorian bath. Take pleasure in ocean views from the private balcony or curl up in front of the TV on the luxurious queen-size, French four-poster bed. A splendid shagreen desk and various original paintings add character. The large bathroom’s centrepiece is a magnificent freestanding Victorian bath, complemented by walk-in shower and two freestanding vanities. Step onto the balcony and marvel at the beautiful sea view. Luxuriate in the plush queen-size bed with gold-framed headboard. This magnificent room features a hand-carved antique chair, leather desk and original paintings. The bathroom is decorated with a shell mirror, single vanity table, shower and freestanding Victorian bath. In the middle of the House, offering partial sea views, this suite opens onto a patio and pool area, furnished with daybed and table and chairs. Opulent furnishings include an extravagant king-size four-poster bed with hand-carved antique Indian buttresses; antique English bureau; antique gilded French chair and original artwork. In the bathroom, shagreen-lined cupboards with double vanities surround the marble sunken bath and shower. This beautiful blue and green-toned room boasts lavish king-size bed with dark wooden headboard; 2-seater silken love couch; zebra skin mirror and footstool. 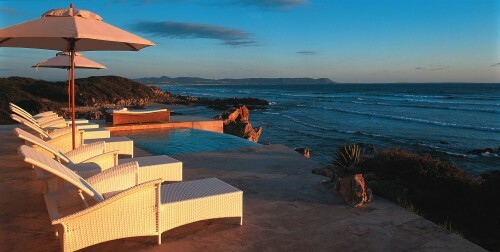 Three wrap-around balconies with cane chairs offer unparalleled views of ocean and mountains. Wallow in the freestanding Victorian bath adorned with two freestanding vanities. 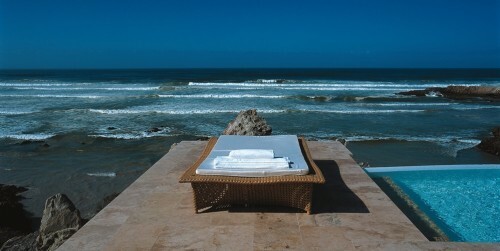 This room offers wonderful sea views from its balcony, which is furnished with cane table and chairs. Inside you’ll find magnificent décor, including a French gold antique chair and shagreen desk as well as two ¾ beds with padded headboards. The bathroom opens onto a mountain-facing balcony and is fitted with two shell mirrors, double marble-topped vanities and marvellous freestanding Victorian bath. Two balconies, at the front and back, enjoy ocean and mountain views respectively. Indoors, luxury abounds with a king-size English antique four-poster bed and two lime green silk high-back chairs. In the spacious bathroom there is an inviting freestanding bath with twin vanities, chaise longue and an open shower. Doze off in the king-size bed with leather headboard or enjoy the open ceilings with white tongue-in-groove finish, two-seater silken love couch and leather desk. Bathe in style – a step-down bathroom features freestanding bath, walk-in shower, antique Edwardian chair and two freestanding vanities. The suite has three balconies with outdoor furniture to enjoy sea and mountain views. This lavishly appointed room has a built-up king-size bed with marble steps, Venetian headboard, Victorian chair, antique oak half moon tables, pink leather chair and original paintings. There is a separate dressing room and a TV cabinet in leather and wood. A cosy balcony with table and two chairs offers wonderful ocean views. The bathroom is extravagantly finished with stone floor, stone freestanding egg-shaped bath, two separate stone vanities and walk in shower. This room’s balconies offer majestic mountain views. 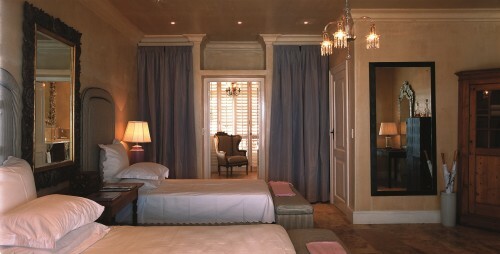 The focus of the room is the hand-painted king-size four-poster bed, complemented by mirrored desk and bedside table. Adding to the grandeur are black lacquered cupboards, antique Chinese vases, original paintings, antique tub chairs in yellow silk and a mirrored TV cabinet. The bathroom impresses with its freestanding bath, double vanities and walk-in shower. 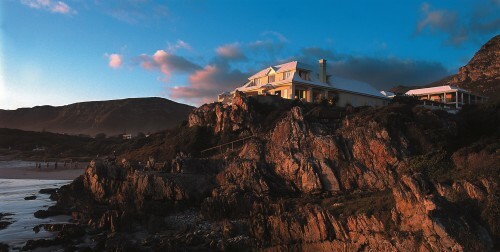 Only an hour and a half from Cape Town, Birkenhead House & Villa are superbly located in unspoilt natural surroundings. Birkenhead Villa is conveniently situated right alongside Birkenhead House, which since its launch in 2003 has set the standards in fine maritime living. 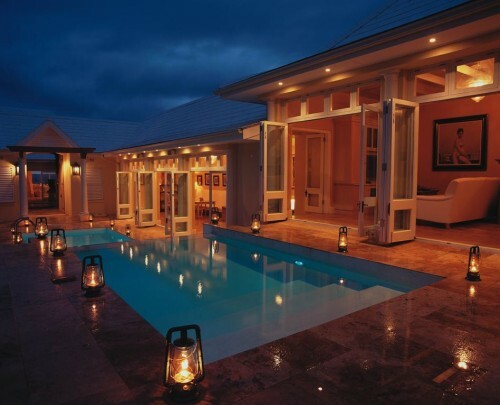 While Birkenhead Villa reflects the same levels of luxury, service and attention to detail as Birkenhead House, special care has been taken to give this superb six-bedroom villa an ambience of its very own. Defining the Birkenhead Villa experience are original artworks, exquisite cuisine and personalised service of the very highest order. The luxury retreats offer everything the discerning sojourner could wish for: from uninterrupted views and diverse activities to the very finest in international cuisine, and richly appointed accommodation enhanced by rich fabrics and antiques. From the comfort of one of the superbly appointed suites, swimming pool or tanning deck, guests can enjoy magnificent vistas over the ocean and towards the towering Overberg Mountains. Other attractions include access to Birkenhead House’s gym and spa treatment centre. 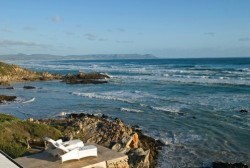 Not forgetting, of course, Hermanus´ two best swimming beaches, which is just a leisurely stroll away. Birkenhead Villa can accommodate children of all ages and is especially recommended for Block Bookings, where guests can have the entire villa (complete with chef) to themselves. Here the discerning sojourner’s every whim is expertly catered for. Superb cuisine, exceptional hospitality and unrestrained luxury elevate this exclusive getaway to a standard way beyond excellence. 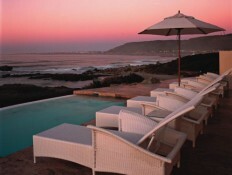 After a sundowner overlooking the ocean, the freshest seafood and most delicious international cuisine can be enjoyed. From morning coffee and cake to hot chocolate beside the fire, there is always something delectable on offer.At Birkenhead House, world-class cuisine is a matter of course. In true fusion fashion, the food is a subtle mixture of modern African Cuisine, Cape seafood, and traditional French techniques with strong Asian and Italian influences. On offer are homemade breads, ice creams and sorbets, as well as delicacies such as tempura strawberries and fresh local fish and Cape seafood ranging from Marlin, Red Roman and Kabeljou to crayfish and mussels. Soups are a treat with flavours as unusual and exotic as vanilla and butternut. Only the freshest ingredients are used for lavish meals served in your choice of setting: overlooking the ocean; next to our dual level pool; in our glass fronted dining area; or simply enjoy dining in the privacy of your suite. Menus and meals can be designed to meet guests’ individual palates and requirements. BRANDON SOURIS Brandon has always enjoyed cooking and from an early age was involved in his parents restaurant based in Centurion, Pretoria. While working there he discovered his intense passion for food and experimenting with new recipes, ideas and products. While completing his NVQ Level 2 and 3 in Food Preparation and Cooking in the UK in 2005, he was employed at the Grapevine Hotel in London and was promoted from Chef de Partie to Head Chef during that time. After 3 years of expanding his culinary knowledge in London, Brandon decided to extend his expertise in cooking and moved back to South Africa to explore African cuisine. He then joined Willoworld (FEAST FINE DINING) as Executive Chef. Brandon built on his expertise here, being an Executive Chef and decided that he wanted to nurture his love of homely style and rustic cooking. Shortly after this, he moved down to the Western Cape and joined Birkenhead House Hotel, part of The Royal Portfolio, which is a privately owned group of luxurious hotels in South Africa. Being a seaside hotel, Birkenhead House is very fortunate to have fresh seafood and have access to other fresh produce in the Overberg area. Brandon likes to keep his dishes simple, the food fresh and seasonal and often includes some of the South African classics on his menu. Only the freshest ingredients are used. The dishes are cooked to perfection, have simple flavours and are beautifully presented. The produce is mostly organic, locally grown, hand-picked vegetables and the freshest seafood from the harbour in Hermanus is used. His long term goal is to become one of the best chefs in the Western Cape. Cooking and being a leader in the kitchen is a passion that has become a part of his life.